The most important decision you will make when you decide to start a business is the overall concept of your business. The second most important decision you will make is your co-founder. I had no idea how to find a technical co-founder, but I gave it my best shot in a typical entrepreneurial fashion. Since transparency is at the very core of our company’s values, I am going to share my thoughts and experience in finding and pitching to Hubstaff’s co-founder, Jared Brown. When starting a business, especially if it’s in the software industry, you’ll discover that there is just way too much work for one person to do. You might find yourself facing tasks that are outside your area of expertise without a partner. I specialize in marketing and operations, so I needed to find someone whose specialty was software development. However, I needed more than just someone who could build awesome software. I needed a co-founder with both technical skills and the drive needed to take ownership of this important part of the business. 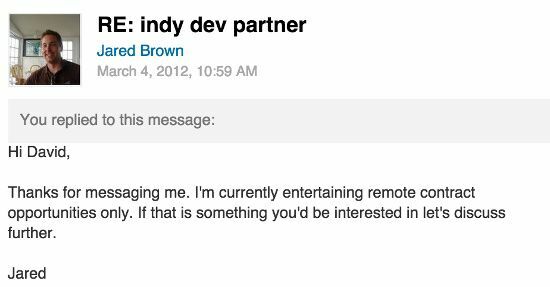 I wasn’t looking to hire a lead developer whom I would manage. I wanted a find a co-founder who believed in the product and was willing to do whatever it took to help get it off the ground. Check out what SnazzyRoom.com did to find a technical co-founder. Completing a product can tell you a lot about a person. No matter what type of business you’re starting or person you are, the dedication to see a project through until completion is something you need to look for. There’s a difference between completing a product and having mediocre coding that was put together haphazardly. Completing a product entails working long hours and taking ownership over something. The product is polished, and time was put into decisions. It shows drive and commitment on a major scale. Don’t worry too much if the product worked on wasn’t a huge success. It’s possible they didn’t know the business side of things or were tasked with doing too much. The important thing is that they showed entrepreneurial ability by tackling and completing a large project. I needed a knockout developer to help me create Hubstaff, but I also needed someone with a business mindset. Yes, we were creating a product but we were also building a business. 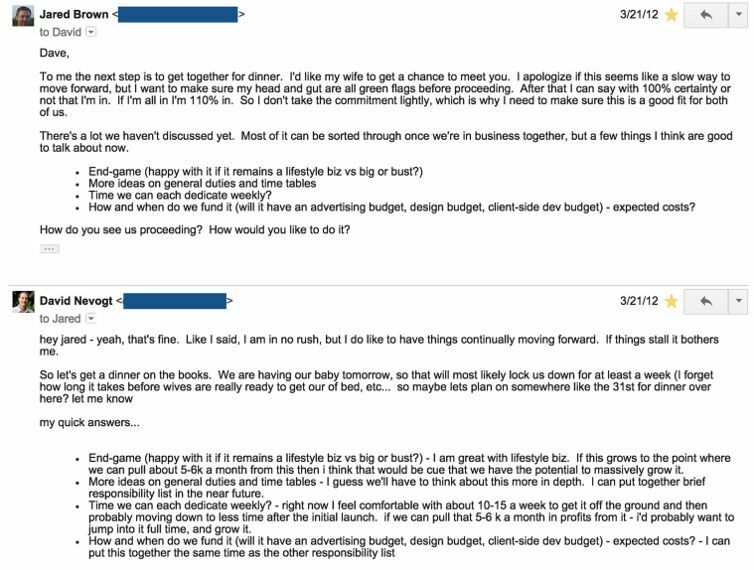 I wanted to be sure my co-founder could put on a business hat at a moment’s notice and help make tough decisions intelligently. Jared is smart and capable both technically and in general business, which has made a big difference over the past few years. You don’t want your co-founder to be a hindrance to growth, which is why I searched for someone with management experience. No one person can handle every task by themselves, and as we grew I knew we would need to take on new developers that my co-founder would have to manage. Knowing he had management experience helped my decision. If you’re going to be bringing someone into your business, it’s a great idea to be able to get a little face time every once in a while. The two of you will be working long hours together and solving complex problems regularly, so that bit of familiarity can go a long way. Finding a local co-founder can be tough, especially if you don’t live in a big city or a city that has a large tech industry. Still, I recommend searching locally first before you expanding to other states or countries. It’s nice to be able to sit and chat with someone over a beer instead of a computer. I’ve found that knowing each other on this deeper level helps us get through disagreements, and become much more committed to the business as a whole. I am not building this business for just myself, but for my co-founder as well. We are a remote company and proud of it. Jared and I live about eight mins away from each other but still only get together about once a week for a short period of time. It’s just more efficient for us to be able to divide and conquer. 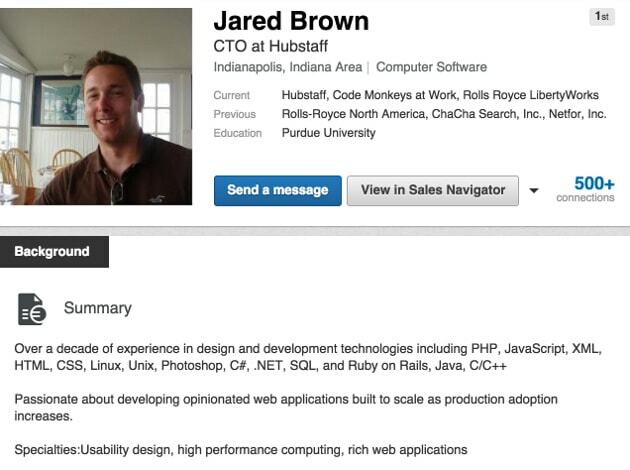 I used LinkedIn to find my co-founder by searching for developers in my area who had the skills I was looking for. This is not the best answer for everyone, but it ended up working well for me. I found a few potential candidates and sent them each a message about my idea. This stage is where you might run into your first bit of trouble, as not everyone will write you back. You may think your idea is great and that anyone would be lucky to work with you, but the truth is that some people are too busy or just not interested. The hard work begins once you get a response. At that point, you need to put on your seller’s hat and explain just why your idea is so awesome and viable. Notice the response time. He responded 12 days later, and it was a pretty short answer. 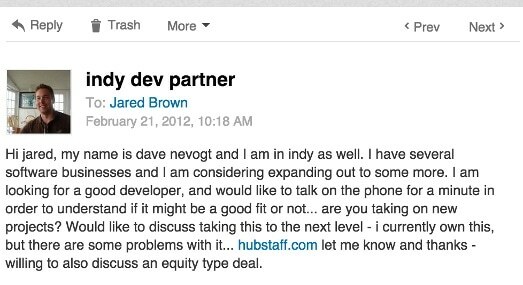 First of all, having to pitch a potential co-founder is not a bad thing. Actually, I believe that’s how it should be done. You want your potential partner to ask questions and take everything into consideration. Smart people should need to be talked into doing stuff, especially developers. Building a new product from the ground up is no easy task, and whoever comes aboard should know what they’re getting into in terms of work and commitment. 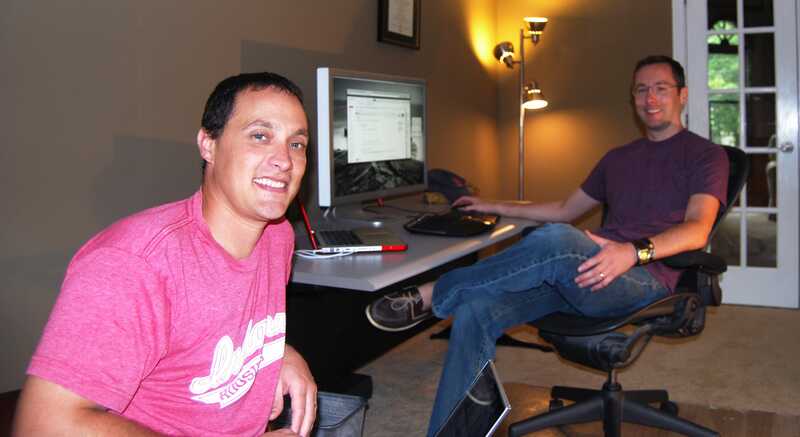 My co-founder came from the developer world, which consisted of hourly rates and monthly invoices. The idea of time tracking software and monitoring was alien to him and he wasn’t too into it at first. So, how did I convince him to get this far? The two best ways to assuage fear in a potential co-founder is by presenting them with data and experience. The data I brought consisted of hard numbers directly related to the time tracking software industry. I had previously white-labeled a solution, acquiring paying customers in the process. I was able to show how many customers I had, how much it cost to acquire each one, and that there was a need for this product. I will not deny that this was a tedious and time-consuming task. There are many ways you can show viability without having to white-label software. You could set up a landing page to track interest in your idea, acquire leads, or even start a blog. The founder of Breeze used a Craigslist ad and landing page to show his product’s viability. Equally as important as the data you show is the experience you bring to the table. I was able to show my track record of establishing and managing several successful online businesses that generated revenue of 1MM and above. Your potential partner needs to know that you have more than just an awesome idea behind you. If you lack experience or wish you had more, there’s an easy solution: Get more data to supplement it! Read how we tested our startup idea before proceeding to the build. When it got to the point of discussing percentages, etc… I suggested that we go 50-50. Why did I do this? Simply put, I was looking for a partner and not an employee. I knew that 5 percent wouldn’t motivate someone. 51-49 still gives one side an advantage. I wanted my co-founder to feel like a true equal and the only way I could do that was with a 50-50 split. I knew this amount of ownership would be motivating because it would be just as much his business as mine. We would be partners and our success would be completely shared. Many people advise against a 50-50 deal because it ends up sometimes in gridlock. I’ve actually found that it works extremely well and would do the exact same thing again. My experience taught me that to build a product like Hubstaff, I would need someone to drive the tech side. I knew that I couldn’t do that. I don’t know about desktop development or Ruby on Rails. There were things I didn’t feel comfortable taking ownership of and that’s why I went to find a co-founder. We have different skill sets: Our different skill sets allow us to divide and conquer. Since we each take ownership over different parts of the business, we don’t have to worry about crossing wires while working. This makes it easier to make decisions as we don’t need to constantly consult one another. We’re both driven: Launching a startup requires an incredible amount of drive, and if both parties don’t have it then things won’t work. Both of you will have to be willing to put in long hours and do whatever it takes to get the job done. If your drives don’t match it becomes pretty apparent early on. We are equally devoted to success: We’re equal partners and share an equal desire to make Hubstaff a success. The 50-50 split definitely helps, but what’s more important is finding someone who is willing to take real ownership and do everything they can to ensure your business’ success. How did you find your co-founder? Let us know in the comments below!